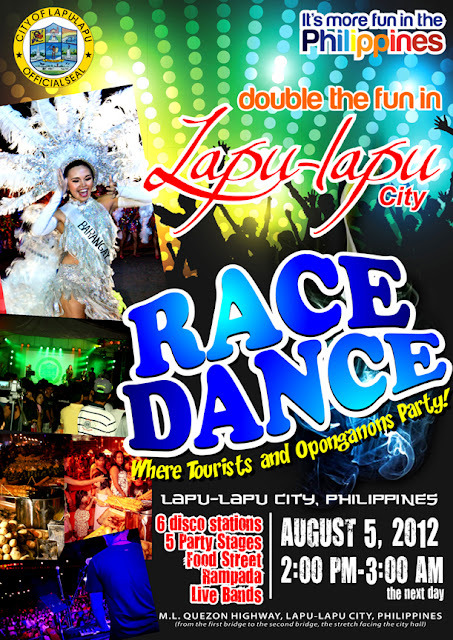 The City of Lapu Lapu will prepare for Race Dance 2012, a 1.8 km street party from the foot of Old Mactan Mandaue Bridge to Marcelo Fernan Bridge on August 8, 2012. The Race Dance 2012 where tourist and Opnganons party will celebrate Lapu Lapu City's hosting of Cobra Energy Drink Iron Man 70.3 Philippines. The Lapu Lapu City Race Dance 2012 starts at 2pm until 3am will feature 6 Disco Stations, 5 Party Stages, Food Street, The City's Festival - Rampada and Live Band performance. The Cobra Energy Drink Iron Man Philipines 70.3 is expected to draw local and international tourists in the City and the Cebu Province alike. 0 comments: on "Lapu Lapu City prepares for Race Dance & Cobra Ironman 70.3 Philippines"